Or "Agadoo" as children of the 80s might think of it. Mods: I changed the size but I am unable to explain exactly how. Somewhere in the dusty recesses of my mind palace I seem to recall I should have had 70 stitches across but I only had 48. More scarfy than shawly. I don't know why. I don't know if I had a duff skein or I messed it up when I wound it or what, but I would invariably find these sections as the yarn travelled through my hand on its way to the scarf, so with approximately two inches on which to spit splice. Very inconvenient. The cake also broke up during the knitting so I had to rewind, and it tangled irreversibly....so although it is only 65g from a 100g skein, the rest is destined for the bin. It is too much work. 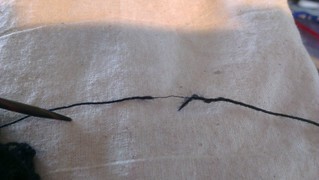 I don't know where the other skein is, but it's going in swaps, for a very low price. I remember buying this yarn, about 87 years ago, and dithering for ages between it and the Malabrigo lace. The Malabrigo had more of a halo and this made it less black, so I went for the Zitron. I hoped it would bloom a little more on blocking. As it is, it definitely feels like a poor man's cousin of the original VLT-scarf-for-Parpy-Jo. But, hopefully she will enthuse over it regardless. And I am reminded that the Malabrigo had actually felted a little before I even finished the scarf, so it's not perfect either. It's still very pretty. And it stretched like a mofo. It was 11x42 before blocking; 15x62 after. 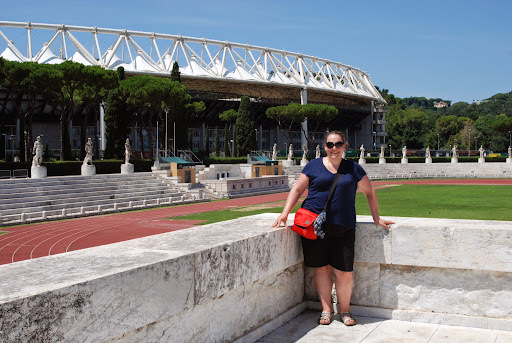 Here I am outside the national stadium, which I visited by accident on a quest to see the Foro Italico which I was was reliably informed was a bastion of Mussolinianism. I was not disappointed. It is very hot here but then we do keep going out around 11am so I suppose we have only ourselves to blame. The hotel is exceptionally fancy; this morning Jeremy Clarkson and Richard Hammond were planning what appeared to be a trip to Argentina over coffee in the breakfast restaurant, and as I write a waitress is pouring mint tea from a silver teapot as I recline by an 18th century tapestry. There must be three blog posts in this hotel alone, let alone the rest of the holiday. Tomorrow we're off to our private Tuscan villa; I don't know how I will cope with not being waited on hand and foot but we will at least have a private pool. Maybe there will be some more blogging from there; I am spending a lot of time reading and napping though, so maybe not.